At any given point over the last several years, David Retsky of County Line Harvest has hosted between one and three interns on his farm. Interns have staffed booths at farmers markets, supported his core crew of farm laborers, and they’ve had the opportunity to learn about the inner workings of the business. In return, he’s provided them with room and board and $300 per week. “It’s a resume builder and they get to find out if they really like agriculture,” says Retsky. “It’s been a win-win.” A win-win, that is, until he had a visit from a California Division of Labor Standards Enforcement (DLSE) official. The DLSE audited County Line and fined Retsky $18,000 for payroll violations. Now he turns down all of the two to three requests he gets a week from young people hoping to come to the farm. A number of small-scale farms have been fined for similar offenses, and there’s a growing consensus among farmers that interns — who, by nature, are compensated in nontraditional ways, with some combination of education, food, housing, and payment — aren’t worth the risk. Such a law could be transformative in California, where the options for new farmers looking to get real world experience are slim and farming education programs are often seen as costly and competitive by comparison. The nine-month apprenticeship program at the Center for Agroecology and Sustainable Food Systems at UC Santa Cruz, for instance, costs $4,800 and accepts 35-40 students each year. Retsky gained his experience over the years as an intern and apprentice on multiple farms, and worries about what this shift could mean for the larger sustainable food landscape. David Little of The Little Organic Farm has hosted many interns on his farm over the years, but has recently taken a precautionary measure. 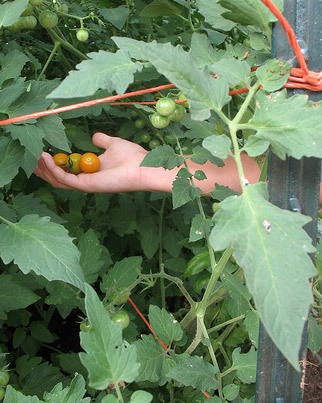 Since internships established through a church or nonprofit fall within the law, Little now hires interns through Multinational Exchange for Sustainable Agriculture (MESA), a program that connects young farmers from outside the U.S. to training and cultural exchange opportunities here. It’s telling that many farmers don’t feel comfortable speaking about internships on the record. One Northern California-based farmer says she is currently working with a lawyer to draw up contracts that allow for an officially binding educational “live/work” situation on her farm, but she doesn’t feel comfortable sharing her name at this point. “We put people on payroll, to fully cover workman’s comp and payroll taxes. On top of room and board, around half their time (14-20 hours) is paid minimum wage.” The rest, she says, is designated as educational time. “We’re formalizing what we’re trying to teach, so there will be formal tutorials on grafting, jam-making, animal husbandry, etc.” One possible approach the farmer is looking into is charging for an educational program, and then waiving the fee when applicable. 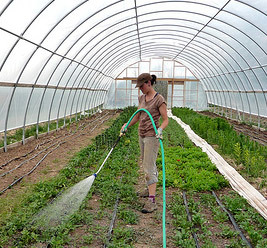 Photo of intern in greenhouse by Jessica Reader.